Today, I decided to follow my curiosity, and see where it took me. As I was finishing up with clients, I was aware that I still needed a first for the day. 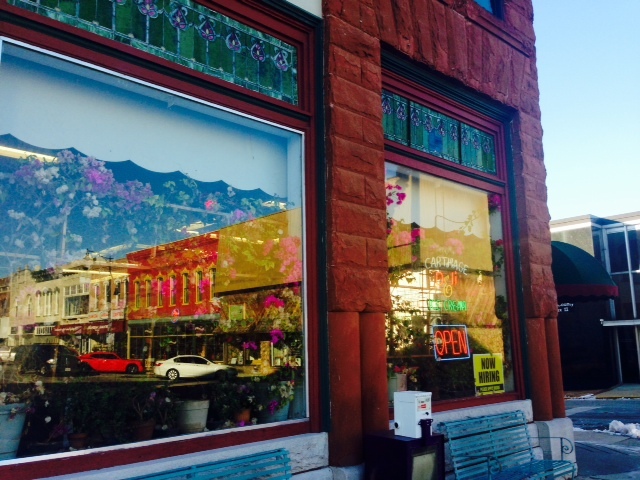 My curiosity drew me to toward the pretty town of Carthage MO, just north of where I was completing showings. As I drove that way, the welcome thought came to me to find a place for afternoon tea. On this bright, cold day, hot tea sounded great! 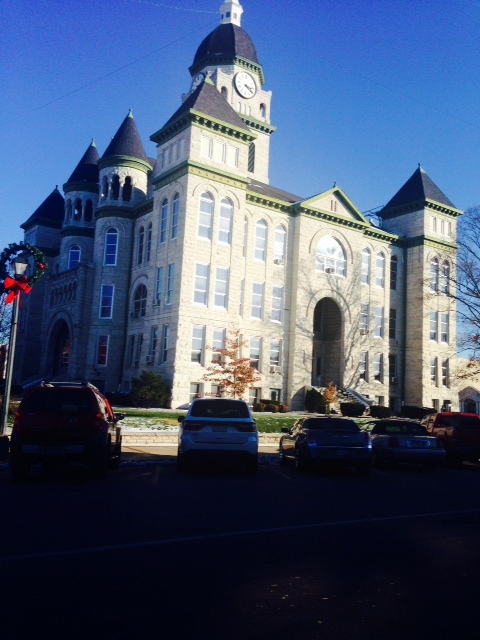 Carthage has a square, surrounding a gorgeous and stately courthouse. Lining the square are offices and antique shops, an art gallery and, on the NW corner, at 3rd and Main, is The Carthage Deli, occupying the old Bank of Carthage building. This was my destination. 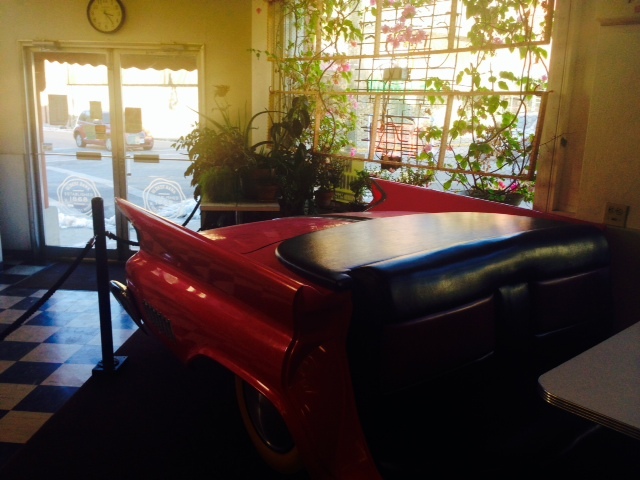 I had never been in the deli, but I’d seen it many times as I cruised around the square. I’d always wanted to step inside. Today, I did. What a delightful surprise. The interior was much more spacious than I’d supposed. Tables and chairs and booths with bright pink cushions provide ample seating for guests. 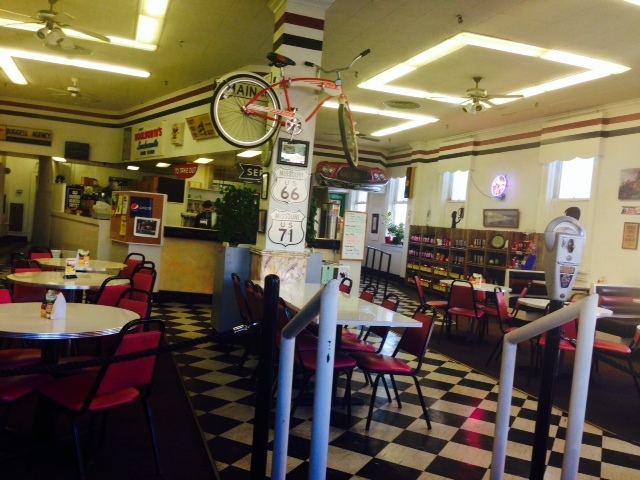 The 1950’s décor featured black and white tiled floors, Route 66 memorabilia and vintage finds and there was a section of a pink car fashioned into a booth. I chose to sit in this spot, which was near the flower filled front windows. The deli offers an assortment of sandwiches, such as grilled ham, bacon and cheddar on a toasted Kaiser bun, or turkey and provolone. They offer a huge variety of specialty coffees as well. I noted Hazelnut Mocha, Autumn Harvest and Mistletoe Joe, just to name a few. There’s ice cream as well, available by the scoop, and I understand their malts and shakes are amazing. The Carthage Deli had a large selection of teas available. I chose something I’d never had before, in keeping with my firsts. The Cinnamon Plum blend, which was delicious, and warmed chocolate chunk scone created a simple and satisfying afternoon tea. I enjoyed spending a leisurely 30 minutes sipping my tea and watching people hurry by outside, arms crossed and heads tucked against the chilly air. Inside, it was cozy and peaceful, the old building well maintained and quietly keeping its many secrets. I left refreshed, warmed and ready to move on with my day. I will visit again, when I’m in the area, and try another flavor of tea. And perhaps next time I’ll sample one of their chocolate brownies.